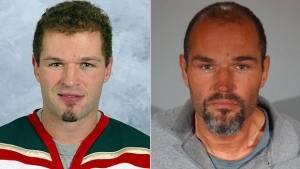 Former National Hockey League enforcer Matt Johnson is in a California jail, charged with felony vandalism following an alleged incident on New Year’s Eve. Johnson was arrested at 6:48 a.m. PT on Dec. 31 by Santa Monica Police Department officers and has been in a Los Angeles jail since then, Santa Monica Police Lieutenant Saul Rodriguez told TSN in an interview. He said Johnson was arrested after allegedly causing $1,900 worth of damage to a Denny’s restaurant early in the morning on Dec. 31. Police arrested him about 10 minutes after he left the gas station, Lt. Rodriguez said. After he was arrested, Johnson, 42, told police he was homeless. A source said the NHL Players’ Association is aware of Johnson’s arrest and is trying to help with his defence. The gas station owner did not file a complaint, Lt. Rodriguez said, so Johnson was not charged with theft. The vandalism charge against him has not been proven. Matt Johnson in 2002 with the Minnesota Wild, left, and his arrest photo from the Santa Monica Police Department on Dec. 31, 2017. Johnson has been in custody since Dec. 31 with bail set at $20,000. During an arraignment hearing on Wednesday, Johnson pleaded no contest to the vandalism charge and declined to request to be released on bail, Lt. Rodriguez said. Johnson also declined the offer of an experienced lawyer and said he preferred to remain in jail until his next court hearing date on Jan. 18. Lt. Rodriguez said the district attorney agreed to reduce the felony vandalism charge to a misdemeanour if Johnson pays for the broken restaurant window. Johnson played for parts of 10 seasons in the NHL. He debuted with the Los Angeles Kings as a 19-year-old in 1994 and went on to play 473 games in the league with the Kings, Atlanta Thrashers and Minnesota Wild, for whom he was briefly a team captain. In a series of interviews with TSN, Johnson’s parents Lee and Brenda described their worry about their son. They both said they can’t discount the role of mental illness in troubles that extend back years and are also are concerned about the addictive painkillers Johnson was routinely prescribed during his time in the NHL. His father, Lee, said Johnson has been in rehab at least four times and has survived multiple suicide attempts. Lee said two of Johnson’s siblings traveled to Los Angeles to try to find their brother. After learning that Matt had been arrested, they visited the jail where he is being held. Matt refused to see them.